Insurance is one of the most valuable lines of defense for all businesses that want to protect their finances and ensure their ongoing success. And, as policyholders review their budgets and lines of coverage each year, they need to know how their insurance costs will impact their bottom lines. The catastrophic damage from hurricanes Harvey, Irma and Maria in 2017 caused an estimated $92 billion in damage, and led many experts to believe that insurance carriers would begin to raise rates for property insurance and other lines of coverage throughout 2018 and 2019. Large property losses continue to be an area of concern for insurance carriers—especially after the extensive damage from the California wildfires and wind damage along the east coast in 2018. Experts estimate disasters caused nearly $80 bullion in insured losses in 2018. However, carriers were able to use $760 billion in excess capital to essentially stabilize the market. Social campaigns, such as the #MeToo movement, have changed how workforces and the general public approach harassment. Cyber exposures were also a growing area of concern for insurance carriers in 2018. If the P&C market demonstrated one thing after the major property losses from 2017 and 2018, it’s that insurance carriers are continuing to focus on specific risks. Underwriters will largely determine insurance rates by looking closely at a business’s specific risk exposures and loss prevention strategies, especially as they relate to cyber attacks, data security and liability. Businesses should expect most insurance rates to increase slightly in 2019 as insurers cover losses from high property claims and liability losses. Over the past two years, the market softened the blow from severe weather losses in part by targeting specific fire, wind, and flood risks. In 2019, carriers should also carefully approach cyber and liability exposures. insurers for most types of coverage. Insurance carriers are also engaging in record amounts of merger and acquisition transactions in order to absorb another company’s book of business. 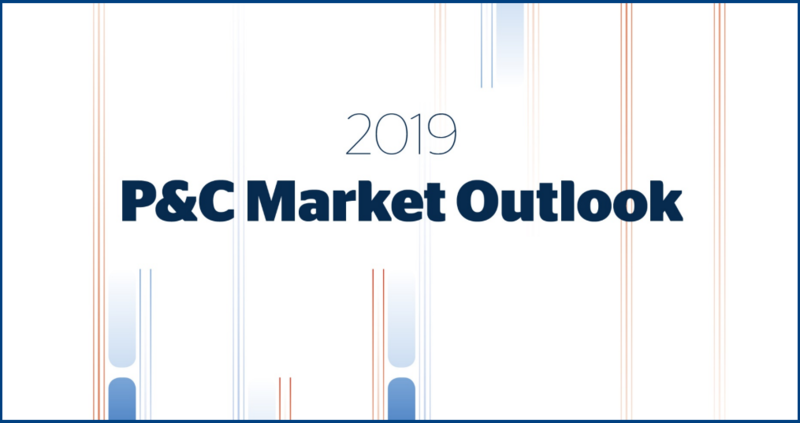 To download the full 2019 Property & Casualty Market Outlook, click here. This Market Outlook is merely a guideline. It is not meant to be exhaustive nor be construed as legal advice. Consult your licensed insurance professional or legal counsel for appropriate advice.